zarinahtakesapaycut: Paul Boorman, either deny the PwC fraud allegations or ask the Malaysian Goons to resign immediately. Paul Boorman, either deny the PwC fraud allegations or ask the Malaysian Goons to resign immediately. The new nickname being bandied around for Johan Raslan and Chin Kwai Fatt is P**cks Without Conscience. How much longer can PricewaterhouseCoopers and Mr Paul Boorman stay silent, now that nothing seems sacred anymore because of the actions of a few Goons in KL? Mr Paul Boorman, you are the Global Leader for Operations for PricewaterhouseCoopers, and suitably qualified to answer on behalf of Johan Raslan and Chin Kwai Fatt regarding the fraud allegations and the scandalous use of a tainted auditor by the largest audit firm in this country, PricewaterhouseCoopers Malaysia, to audit one of its own companies , a company whose existence has been questioned since 2003. We are not asking this in jest. Do you know that both Johan Raslan and Chin Kwai Fatt are playing cat and mouse with the Malaysian media? They are not even returning phone calls. 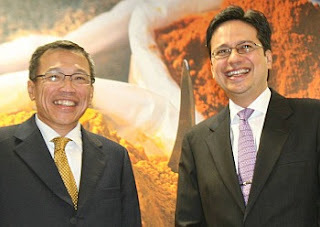 The very least you can do is get the PricewaterhouseCoopers Global Media Center to deny or answer on behalf of the Country Managing Partner and the Executive Chairman for PwC in Malaysia. On Wednesday, three different phone calls made to Chin Kwai Fatt, were answered by three different secretaries, who gave three different reasons as to why he cannot come to the phone!! Chin Kwai Fatt, the Country Managing Partner and Johan Raslan, the Executive Chairman for PwC in Malaysia, have started to play a cat and mouse game with the Malaysian Media because of the ongoing fraud allegations! On top of that, are you aware Mr Paul Boorman, that PricewaterhouseCoopers Malaysia is also a Registered Public Accounting Firm with the Public Company Accounting Oversight Board (PCAOB) in Washington, DC, America? The PCAOB arose after the enactment of the Sarbanes-Oxley Act of 2002, a consequence of accounting scandals like Enron and WorldCom. Apart from the PCAOB, the SOX also covers areas like Corporate and Criminal Fraud Accountability. Mr Paul Boorman, has PricewaterhouseCoopers Malaysia not infringed on the SOX and PCAOB rules and regulation? What steps have you taken Mr Paul Boorman, to notify the PCAOB on the allegations of fraud by PwC in Malaysia? And finally, PCAOB, what are you going to do about this ongoing fraud by PricewaterhouseCoopers Malaysia?